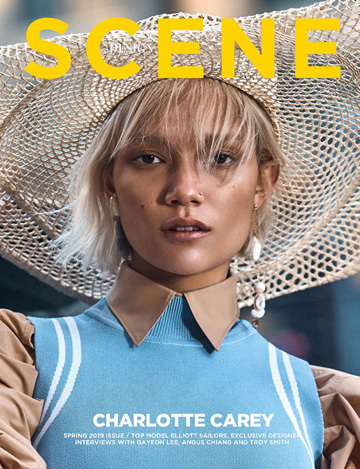 For the Summer issue of D’SCENE Magazine Kati Chitrakorn meets with BRAD KROENIG to talk soccer, misconceptions of male model and his five year old son Hudson, Chanel‘s newest runway favourite. Trips around the globe on a private jet, supplied designer outfits for every occasion, and having Karl Lagerfeld, arguably the most recognizable fashion designer in the world, as one of your closest friends – it may all sound like the stuff of dreams. But for one gallant, 6’1”, blonde, hazel-eyed model, this is hardly a fantasy. Brad Kroenig, hailing from a middle-class suburb south of St. Louis, Missouri, has come far since his modelling debut in an Abercrombie and Fitch catalogue, photographed by Bruce Weber, in 2002. Set the clock forward 13 years and Kroenig now works for Chanel and Fendi, the fashion houses where Karl Lagerfeld is head designer; not to mention, he was the subject of the designer’s four-volume book, Metamorphoses of an American, which “traces [his] physical and emotional development [as] the world’s most sought-after male model.” In 2008, Kroenig and his wife, Nicole, had Lagerfeld’s godson – the 5-year-old Hudson Kroenig – who has made appearances on many a Chanel runway. By 2003, Kroenig had swiftly moved up the modelling ranks, having debuted on the Jil Sander and Dolce and Gabbana runways in Milan, as well as appearing on the covers of VMAN, L’Uomo Vogue and Interview. That same year, when Kroenig was 23, he was flown to Biarritz, a beach town on France’s south-western coast, for a VMAN shoot for which Lagerfeld would be the photographer. Having caught Lagerfeld’s eye, the designer photographed Kroenig constantly, which led to Kroenig starring in a campaign for Fendi – one of the labels alongside Chanel for which Lagerfeld still designs 17 collections a year for. Kroenig began to appear in Fendi and Chanel ads almost every season, and gradually built up an indomitable modelling portfolio, having been shot by the likes of Patrick Demarchelier, Craig McDean, Mario Testino and the late Richard Avedon. In 2004, Kroenig was named top male model by MODELS.com, a website that provides rankings for the industry, and held the title for three years. Not to mention, he has remained Lagerfeld’s muse for over 10 years. In 2007, Kroenig walked his first autumn/winter show for Chanel in Paris, and has since been kept as part of Lagerfeld’s self-selected family, working with the designer on various lines. Indeed, while models – both male and female – tend to live a fast life and it’s easy to burn out once you’ve passed your teenage years, Kroenig continues to thrive, in both his attitude and his work. “I still enjoy both runways and shoots – they are two totally different experiences and I enjoy them equally,” he commented cheerfully, although highlighted that today there still remains some looming misconceptions about the male modelling industry. “A lot of people tend to think that male models are uneducated and they thrive off their looks alone, but most of the successful male models I have worked with over the years are very smart and well-rounded,” he said. At 35, Kroenig remains dynamically handsome, and has stacked up a remarkable list of agencies all over the world who are eager to represent him, from Ford Models in New York and Chicago, to Success Models in Paris, Nevs in London, and d’Management Group in Milan, as well as Sight Management Studio in Barcelona, 2pm Model Management in Copenhagen, and Kult Model Agency in Hamburg. For aspiring models looking to follow in his footsteps, Kroenig advises: “You have to be ready to give it your all. You need to have a passion for it, and be willing to live a very healthy lifestyle.” If his impressive endurance in the swift-paced, easy-come easy-go world of modelling is anything to go by, that sure is sound advice to us.